Back in 2006, when not one but two films about the 9/11 attacks – Paul Greengrass’ United 93 and Oliver Stone’s World Trade Center – were made and released within months of each other, there was a certain outrage by people who felt that it was too soon for Hollywood to be dramatizing these horrific real-life events for entertainment purposes. For many, the pain was still too strong to have events from that day be re-enacted on the big screen, so up until their initial releases there was much speculation over whether filmmakers should be able to tell these stories so soon after they actually happened. History now repeats itself with Peter Berg’s Patriots Day, a film about the Boston Marathon bombings in 2013 that was made even sooner after the event than either of those 9/11 films – three years since, to be exact – and once again, there was initial outcry over whether Hollywood was exploiting real-life tragedy for the sake of entertainment, especially when the tragedy itself is still a clear memory for some. 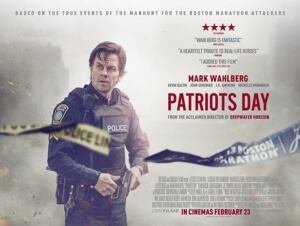 However, if the entertainment itself is very well done and in a way that honours the heroes and victims of the event with great respect and heart, then there’s really no reason to complain, and luckily Patriots Day fits that mould exactly. Berg takes the docudrama route for his film, mixing dramatized re-enactments with snippets of real-life footage, composed of everything from news clips to amateur videos to surveillance footage. That way, he ensures that the overall story, from the initial attack to the eventual capture of the terrorist Tsarnaev brothers (Alex Wolff and Themo Melikidze), is told as accurately as possible, and not lost within the dramatized re-enactments which feature actors like Mark Wahlberg, John Goodman, Kevin Bacon et al. He uses this method not to shock the audience, but to provide them with a strong account of what really happened, one that through tight editing and focused direction succeeds at providing a detailed and thorough examination of this tragedy, and the events immediately following it. The closest comparison to make with this film is easily Greengrass’ United 93, which also took a similar docudrama route and used a mix of re-enactments and real news footage to perfectly create that sense of dread and eventual heroism in that particular instance; Patriots Day does something similar to that film, while also giving us a very well-made, well-acted and well-handled piece of entertainment that never feels as exploitative as it easily could have been. It is also interesting that Berg, who also co-wrote the film, places a good chunk of screen time not on the bigger names in the case like Wahlberg or Bacon, but on seemingly-minor characters like a young couple, a father with his young child, an Asian man, a campus police officer, some stoner college students and a few others, all of whom would eventually become inadvertently involved in the attack and pursuing manhunt of the Tsarnaevs. The film is much more of an ensemble film than people might expect, and while the acting is excellent from everybody, no one performance stands out from the rest, letting each one of these people feel as real and grounded as possible. In the case of these smaller players, Berg writes them as fairly normal people who end up having their lives altered or disrupted thanks to the attacks. It really drives home the fact that no matter how much heroism is depicted in this film, there were still people who lost many things in the process, whether it be certain body parts or even their lives, and Berg is wise to dedicate as much time as he can to those smaller figures who truly suffered during all of this, instead of focusing all on one individual lead like Wahlberg and have it just be from his perspective. For a film that’s meant to promote the power of unity, Berg has really nailed it in terms of making his film a true ensemble piece. On its own, the film still remains a thrilling and often intense watch. It’s perhaps a little too long at 133 minutes, which certainly starts to feel that way not long before things wrap up, but at least it fills up that time with moments of hard-boiled drama and edge-of-your-seat tension that holds your attention all throughout. The Tsarnaev brothers are depicted, rightfully, as cold-hearted monsters who when provoked can be pretty terrifying. Listening to them ramble about crazy conspiracy theories surrounding the 9/11 attacks, which they claim was actually done by the US government to get everyone to hate all Muslims, creates that increasingly disturbing feeling where you feel trapped with these two insane extremists and, like the poor individual they initially carjack and kidnap, desperately want to escape. Meanwhile, as the investigation goes on and we see how all the pieces eventually came to fit together, there’s a real sense of time slowly running out before these two go on to do even worse things, and even though we all know how it comes to an end you still feel as though anything could happen. Berg has always been a strong enough filmmaker to mine the tension for just long enough to keep the audience invested (except for Battleship, but we’ll let bygones be bygones), and with this and his other recent film Deepwater Horizon he has been able to successfully create nail-biting drama and intensity from his findings. It’s a well-made film that combines intriguing docudrama with full-on intensity, but Patriots Day never forgets its true nature of honouring those who came forward during those difficult times, and that makes it a truly noble film. Patriots Day is a thrilling docudrama that successfully combines dramatized re-enactments of the events surrounding the Boston Marathon bombings, with an intense piece of entertainment that never forgets to honour its heroes and victims.